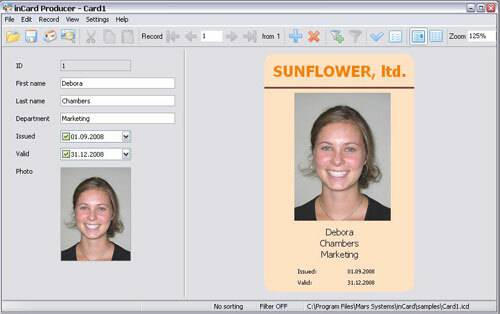 Incardex Producer module of Incardex software provides an ability to enter personal information and photos, select the pre-designed ID card layouts, and print ID cards. Incardex Producer window has menu, toolbar, and work area. The menu in the upper part of the software window provides access to Incardex Producer commands and settings. The toolbar provides quick access to the most often used Incardex Producer commands and settings. Using toolbar buttons you can open a pre-designed ID card layout. The database connected with this layout will be opened and ready for filling in. To add a first entry to the database press New Entry button on the Toolbar. The database can be viewed in the Form mode and in the Table mode. The Form mode is used to enter data and insert photo. The table mode is more convenient for database searching and filtering, for marking the database entries to be printed out. The work area is devided into two parts. On the left you can see the database fields to be filled in with the cardholder information and photo. On the right the ready to print ID card is displayed. If the database has several pre-designed ID card layouts it is easy to select the required layout, and it will be connected with the database entry.